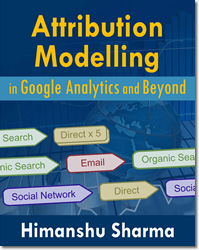 How to set up Data driven attribution model in Google Analytics? 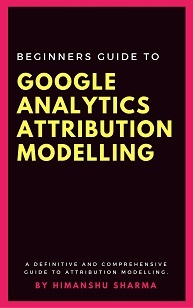 If you are brand new to attribution modelling, then read this article first: Beginners guide to Attribution Modelling in Google Analytics. 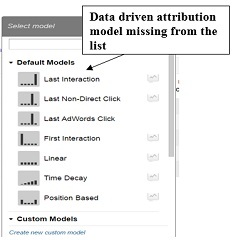 Data driven attribution model (or DDA model) is a baseline model. By default this attribution model in not enabled in a Google Analytics view, even when your GA property itself is enabled for GA premium. 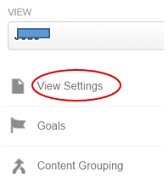 Make sure that you have set up enhanced ecommerce tracking and/or goal conversion tracking in your GA view. 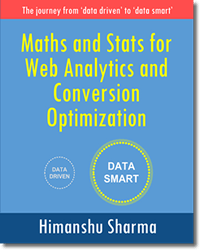 You need ecommerce and goal conversions data to generate DDA model. Without these trackings set up, Google Analytics will not be able to generate DDA model for you. Setting up enhanced ecommerce tracking is not a mandatory requirement to generate a DDA model. You can also use standard ecommerce tracking. The advantage of using enhanced ecommerce is that, it provides much more ecommerce data than the standard ecommerce tracking which can be used by DDA model to produce much better attribution model output. In order for Google to generate most accurate DDA model possible, you should link all of your Google Accounts (like Doubleclick Campaign Manager, Google Adwords, Google Search Console, Google play, Google Big query etc) to your Google Analytics account. 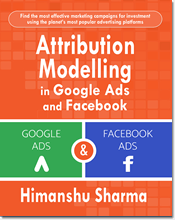 This is not a mandatory requirement for setting up DDA model but since DDA model can analyse data from all Google accounts (which are linked to your GA account) and not just your GA account, so if you link all of your Google accounts to your GA account, then you would get exponentially better insight from your DDA model. 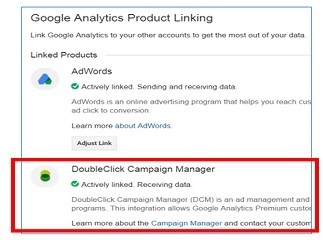 For example, if you use Doubleclick campaign Manager(DCM) or Doubleclick Bid Manager(DBM) account then make sure it is linked to your Google analytics account. 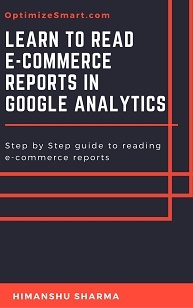 This integration will make you eligible for GDN impression reporting through which you can see view-through conversions data in your multi-channel funnel reports. 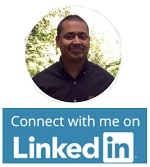 Contact your GA premium/360 account manager and ask him to link your DCM/DBM account to your GA account and then enable the GDN impression reporting. This confirms that your DBM/DCM account has been successfully linked to your GA premium property. Do similar checks for other Google products and make sure all of your Google accounts are actively linked to your GA account. 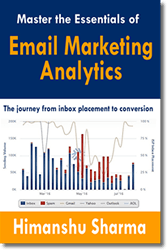 Step-3: Integrate as much data as possible with Google Analytics. 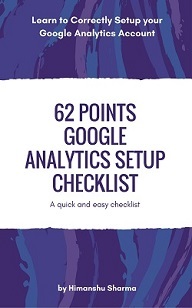 This could mean, integrating your: CRM, Shopping cart, Phone call tracking software etc with Google Analytics. This could also mean, setting up/fixing cross domain tracking, cross device tracking and/or tracking offline conversions online in Google Analytics. 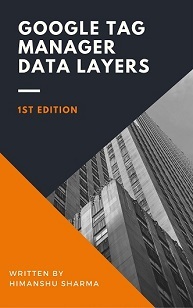 The more data you feed into your DDA model, from different marketing channels and devices, the higher will be the quality of your DDA model output. 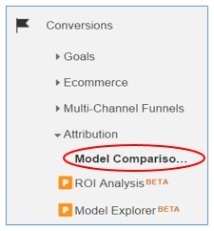 In order to do ROI analysis in Google Analytics using DDA model, you need cost data in your Google analytics reports. 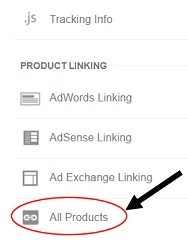 If your Google Adwords account is already linked to your GA account, you will automatically get cost data from Adwords in your GA reports. But for other paid marketing campaigns, you would need to import their cost data manually or via the management API. 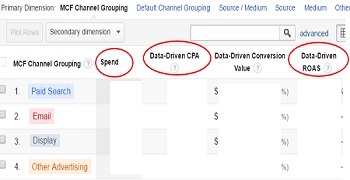 Navigate to the GA premium view for which you want to enable data driven attribution modelling. Select that GA premium view which can meet the minimum conversion threshold for setting up DDA model. The minimum conversion threshold for setting up DDA model is at least 400 conversions per conversion type with a conversion path length of 2+ interactions and at least 10,000 conversion paths in the selected reporting view in the last 28 days. So your selected GA premium view must have recorded at least 400 Goal conversions and/or at least 400 transactions with a conversion path length of 2+ and at least 10,000 conversion paths, in the last 28 days period. If your selected view does not meet the minimum conversion threshold requirement, then Google Analytics will not be able to generate a DDA model for you. In other words, the DDA model will appear in your selected GA view only once it meets the minimum conversion threshold requirement, for producing a DDA model. Otherwise you may have to wait for weeks, to see DDA model in your GA view. However, if your selected reporting view, already meets the minimum conversion threshold requirement, then GA should produce the DDA model for you, within 7 days. So within a week, you should be able to see the DDA model in your selected view. #6.3: Select DCM floodlight conversion type for which ‘Data Driven Attribution’ will be generated. You can select up to 20 DCM Floodlight conversion types. This step is optional, if you do not use DCM. Note: Double Click for Advertisers (or DFA) has been replaced with DCM by Google. 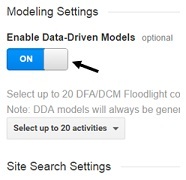 You can select DCM Floodlight conversion types only when your DCM account, is linked to your Google Analytics account. 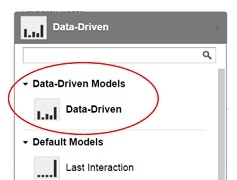 #6.4: Click on the ‘save’ button and then wait for a week, for GA to analyze your data and produce a DDA model. 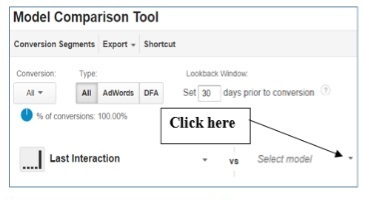 #6.5: Navigate to ‘Model Comparison Tool’ (under Conversions > Attribution) in your DDA enabled GA view and then click on ‘Select Model’ drop down menu.